Subject of audit are the components of eCall Control Centre Technology to be used in Public Safety Answering Points (PSAPs) enabling eCall in a PSAP. The certification mark is awarded within the framework of voluntary certification based on defined test criteria derived from applicable eCall standards. 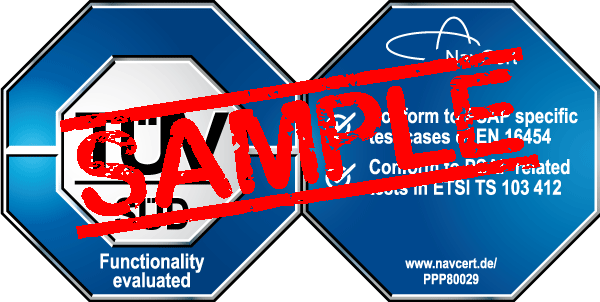 NavCert also reviews the process for the continuous adjustment of the testing environment to new standards and for quality control of the software development in an audit. Depending on the executed tests one of the two certification marks is issued, one acknowledging conformity to EN 16454 and the second additionally conformity to ETSI TS 103 412. Conformity to EN 16454 is verified by means of application testing and audit. By the process of application testing it is validated that the PSAP component reacts correctly to the applicable test cases of EN 16454. Additionally in an audit it is checked, if the development and enhancement of the eCall components of the eCall Control Centre Technology underlie controlled procedures and methods. This is done according to controlled procedures assuring that the quality of the component of the eCall Control Centre Technology will be maintained for updated standards or functional improvements. The ETSI standard TS 103 412 defines the technical requirements of the end-to-end performance in the context of the MSD transmission time to the eCall control centres. The performance of the decoding of the received MSD is evaluated using the speech codec and radio conditions of table 7.1.4.1.5-1 in ETSI TS 103 412. All offered features have been tested with respect to correct functioning. It was tested if the user receives using a function the expected result.